The are many ways to add a logo to a bar stool. You can embroider the stool, screen print the stool, digitally print the stool, or add a decal. There are pros and cons to each option. Embroidery works great on the back of bar stools with backs. You can embroider the back side of the back and it will look great and last for years. If you embroider the inside of the back or the top of the seat, eventually the threads will start to rip. There are certain types of decals that will bond to anything. These decals are the same type of decals used on off road motor bikes. They are applied with a chemical and fuse with the material. These decals look great and last for years but have very expensive setup charges and very high minimum quantities. Traditional screen printing is still the most popular way of imprinting a bar stool. Screen printing provides a durable product with low minimums and a low unit cost. 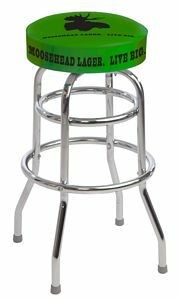 Four color process screen printing allows for low res photo realistic images on a bar stool. Four color process printing is very expensive due to the high screen mesh needed to achieve the proper shading. The last method for today’s entry is digital printing. This method is brand new. The idea is simple, print on the bar stool with a big printer instead of screen printing. This method works great for small quantities. Digital setup charges are typically less expensive than screen printing setup charges. At this time, most bar stool manufacturers are unable to achieve a good digitally printed black. 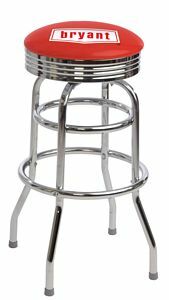 BarStoolsandChairs.com, experts in manufacturing high quality Custom Logo Bar Stools for restaurants, bars, clubs, hotels, and homes. 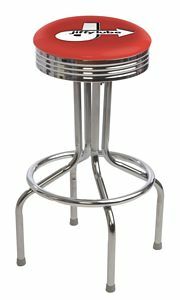 They offer custom logo bar stools in various designs and materials with 70 different vinyl patterns. You can even choose your own material to upholster your bar stools and chairs. No user responded in " Logo Bar Stools : Digital Printing Vs Screen Printing "